Below are several links to perl-related data that you may find useful. www.perl.org: Perl Mongers, ''The Perl Advocacy People''. The umbrella organization for the various regional Perl Mongers groups, also know as perl user groups. www.perl.com: "The Source For Perl", by O'Reilly publishing. Articles and information about perl development and conferences. use.perl.org: News and articles about happenings in the perl world. cpan.perl.org: The Comprehensive Perl Archive Network. The central repository for open-source perl libraries and modules. Tom Christiansen Perl Consultancy: Private, corporate training to meet your company's unique Perl training needs. Stonehenge Perl Training: Randal Schwartz and company offer classes in introductory and intermediate Perl programming, as well as CGI programming in Perl. Consultix: Tim Maher's software training services company, specializing in Perl and Unix instruction. Tim, who is based in Seattle, Washington, has been using Unix since 1976 and teaching since 1986. 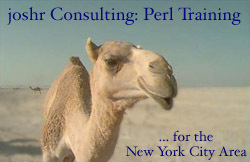 Perl Training Israel: Gabor Szabo's perl training and consulting service in Israel, offering classes in a variety of perl subjects. Accelebrate Perl Training: Atlanta-based CGI and XML programming with perl.